Posted by Angel Dan on 1/14/2019 10:15:33 AM. When seeing this title, you will wonder what the VitalSource VBK DRM removal is, why I need a vbk ripper. You purchased a book from Vitalsource, and you are forced to use Vitalsource bookshelf app to view and download this book. By default this book will be saved with '.vbk' appended. But soon you found that the reading experience with bookshelf (especially on android) is really crappy (quite annoying and slow), then you would like to use other programmes such as iBooks to read your Vitalsource etextbook. But what's worse, after you import the .vbk file into your iBooks app on iPad, you will find your iPad doesn't support this format! In this guide, I will explain what the .vbk format is, why we need to remove DRM from vitalsource VBK, and also introduce 3 powerful Vitalsource drm removal tools (based on my test and experiment) so that you can remove DRM from vitalsource bookshelf books fast and lossless. It removes DRM from Vitalsource .vbk files and helps you get DRM free PDF or ePub eTextbooks. VitalBook format .vbk files are DRM protected eBooks purchased from VitalSource. In other words, if you bought one book from Vitalsource store, it will be .vbk file. In fact .vbk file is only readable for Bookshelf app, which is the default and unique reading app for vitalsource ebooks. Where could I find the downloaded .vbk book files? In general, Bookshelf will download all purchased vitalsource eTextbook in "VitalBook Library" folder. 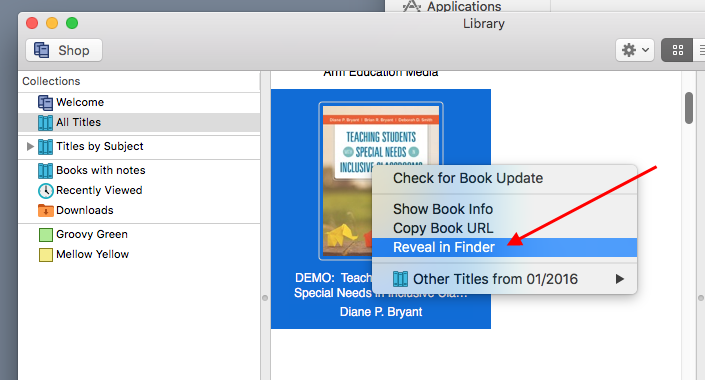 Tips: If you can't find the paths, please open the VitalSource Bookshelf on your computer, in the library select one book and right-click on it, then choose "" (Reveal in Finder on Mac). But in this part what I most want you to know is, .vbk is not a regular format of eBooks but just the container format. It's just with .vbk extension which lets us and vitalsource know that the book is from vitalsource. Now there are currently 2 distinct categories of book formats that can be contained by the .vbk file: Reflowable Text VitalBooks (EPUB) and Page-Fidelity VitalBooks (PDF). We are not so strange to epub and pdf because they are the most 2 popular and widely used eBooks formats, right? EPUB format's feature is we can easily adjust the font size no matter the size of the screen. PDF format's feature is it keeps the look and feel of a bound book (the text is fixed). Both types of eBooks in Bookshelf app are with .vbk extension. If you asking me how to recognize out which vbk file is a PDF or which one is an epub, I will recommend you visit the "Product Details" page for the title you read from vitalsource.com store. For example here I want to bought this book for learning "Publication Manual of the American", after I visited to this product details page, I saw this highlight from the "eTextbook Features" as following image shows. 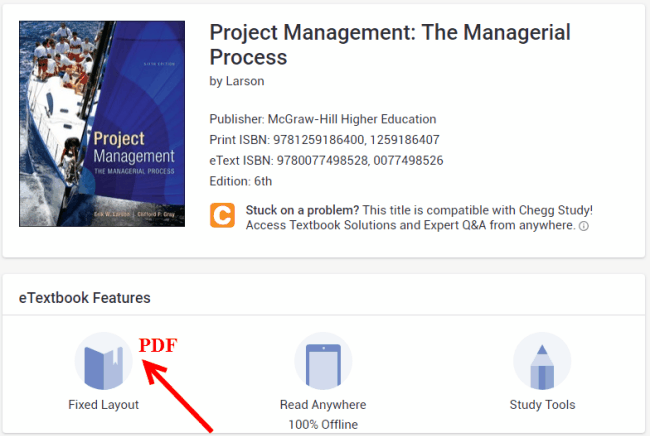 If you can see the "Fixed Layout" from the "eTextbook Features" area, it says that the truly eBook format of that book is PDF, while if you see the "Reflowerbale" it says that it's an ePub format. Of course both of these 2 formats are saved as .vbk file after you syncing them via Bookshelf app. A new method (and easier) to tell if the vitalbook is a PDF or an ePub. Since the Bookshelf version 7.6.1 and later, the bookshelf itself will also tell us which the vitalsource original eBook format is. No need to check them from the product page. 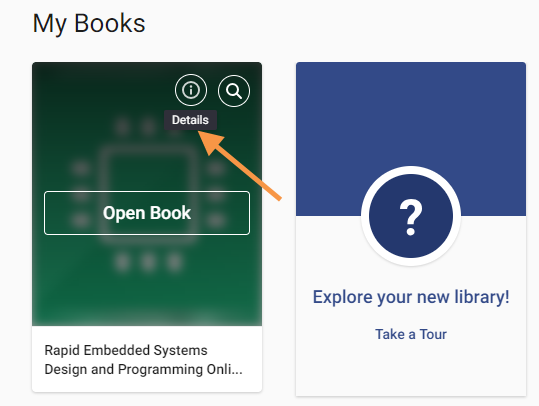 Open your VitalSource bookshelf, select "My Book" and click the "Details". Then it will pop up a new small window from the right side, which shows you the book format, book vbid, url, etc.. If it says "epub", this means that book is EPUB format; If it says "pbk", this means that book is PDF format. As what I explained above that the first feature of the vbk files is that they are DRM protected by Vitalsource unique technology, which prevents us reading vitalsource books freely on other devices or apps, for example, reading vitalsource books on Sony Reader, Kindle, or iBooks. We paid so much money (you know the price of the text book is not so cheap) to purchase a book to learn something new and useful, but finally we found that what we bought is not belong to us! This really hurts us too much, isn't it? We all know that the downloaded vbk files in fact are epub and pdf, but the result is that we can't open them on other devices we owned though these devices also supports epub and pdf well. This is a paradox! As my own opinion, the final most important reason that urges me to use a vbk drm removal is that, neither vitalsource ePub nor vitalbook PDF allows me to print Vitalsource ebooks all pages at once. 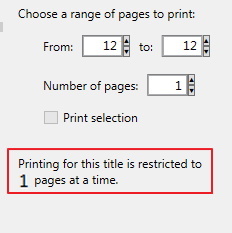 According to the publisher settings, some books can be printed 10 pages at a time, some are restricted to just 1 page at a time. If I have a tool to remove the DRM limitation I can bypass the print limit as well. This tool is only for those readers who are familiar with Python and computers. If not, please skip this part. Firstly you must make sure you have installed the Python 3.6 tool on your computer. Once finished please also donwload vitalripper.py file to your computer and save it somewhere. Visit vitalsource official page, log in with your own account, select "My Bookshelf", select the book and click on book cover to open it. In this case the number 9781911531081 is my book number. 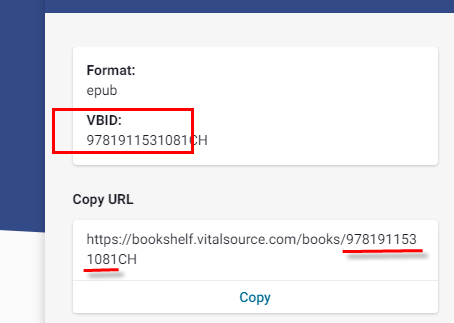 Update: From VitalSource Bookshelf version 7.6.1, we can also find the VBID from book by clicking on "Details". Once finished the commanding you will soon get your VitalSource eText book drm removed, they will be saved as a PDF file (many images included). Please remember that this tool only for vbk PDF format books, not for reflowable ePubs. Note: This method was first provided and share here: Vitalsource to PDF reddit. When searching on the Internet to find an easy-to-use tool to help us remove DRM from .vbk files, you will soon find this ebook-converter Vitalsource Converter Pro. This tool works for not only PDF but also ePub, helps convert these 2 formats to PDF, DRM free. This is a shareware but here I just used the demo version for testing. When I start the software, I'm requested to input the vitalsource account email address and password. Then it take several seconds to list my library (at first what I see is blank, I guess it takes time to read my library data), soon I see what I want. Click on the book cover to open one book, the same phenomenon appears again (blank window) but soon I see a window like this. It's preparing to download the vitalsource vbk files to pdf. 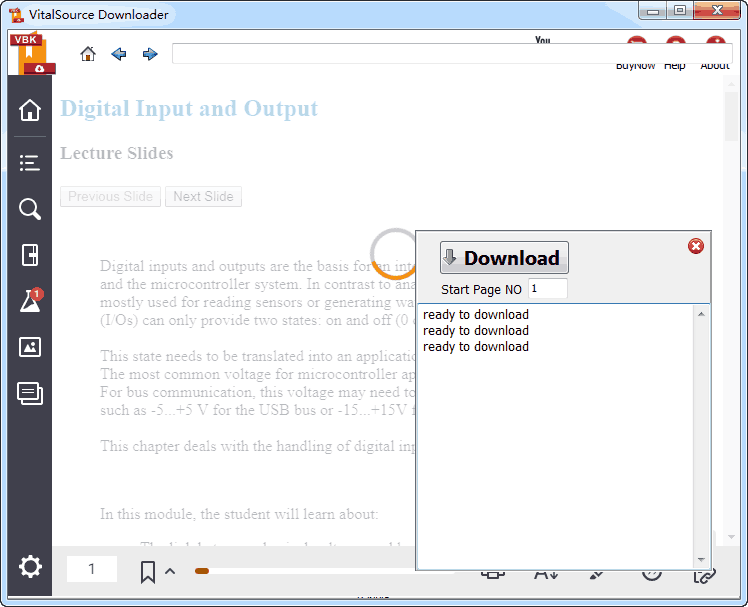 Then click on "Download" button, it will begin to download all pages and save them in an entire PDF or ePub. Once converted well it says "Do you want to open ebook file". I like this design. I just choose 2 books for testing, then I found the average speed of the converting the PDF is 5 pages/minute, ePub is much more slowly (will not so correct but just my own conclusion, depends on the Internet accessing speed, and books size). Here I need to tips you that the demo version will add watermarks into all pages of your PDF books if the original text book is PDF format. If the chosen book is ePub format, after drm removing it will still be saved as ePub format but it will not show all the pages contents, the vendor cuts some pages out and add their own pages for advertising. 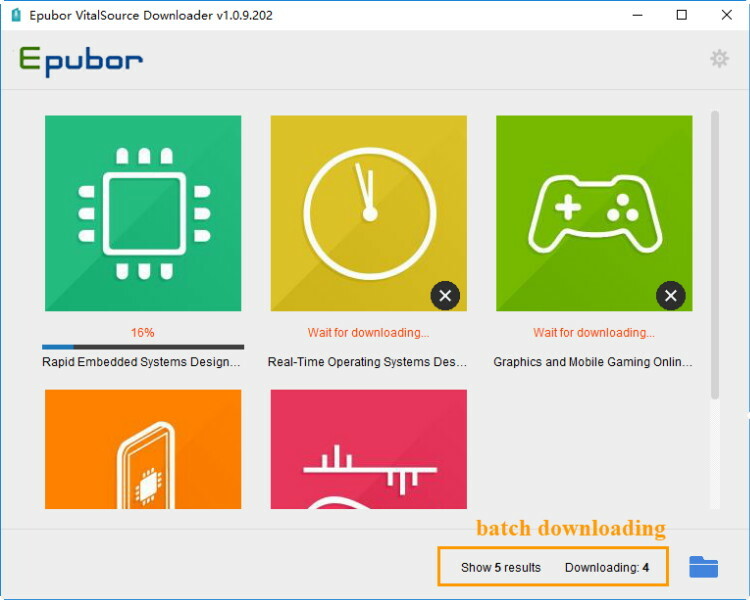 This tool Epubor Vitalsource Downloader introduced here was developed by Epubor team in April 2018. At first the new released version 1.0 does the same processing which keeps the original eBooks formats (if the original eBook file format is ePub, the output will be ePub; if it's a PDF the output format will be worPDF). But soon a new version updated since nearly 90% of customers sent letters to the support team that they want to print the vitalsource text books and wish to get all the books as PDF format. So you will find that from version 1.2 the software supported output is PDF only (but no changes to the original books' contents). I guess you may be one of them who just wants to use a vitalsource drm ripper to print vitalsource eBooks, right? Just input your own vitalsource bookshelf account info correctly. This step is simple but it may take some time especially if your Internet speed is slow. So please be patient. Click the book cover, the downloading will soon begin. As the image shows, this software supports batch downloading . There is no need for you to wait the downloading completed one by one, just choose them all, waiting for the work finishes, OK. But please note that during the downloading period you can't do anything but waiting. I will recommend you do your other things with epubor vitalsource downloader running! Another thing I need to let you know that the free trial version of this software will help you download 5 pages of each book. I choose the same 2 books to test, the converting speed of PDF format text book is 10-15 pages per minute (from the new version 1.0.5, the speed is improved much up to 30 pages per minute), and the ePub to PDF will be a little slowly that about 3-5 pages per minute. Once the conversion finishes, a window will pop up which shows you the pdf file. In general the saved output path is \Users\...\Documents\Epubor VitalSource Downloader. You can copy them to other readers such as Kindle, Kobo and even iPad with iBooks. And as the PDF files are drm removed out so you can also share them with families and friends (for personal use). Should let you know that the free trial version of this tool only helps download 5 pages of each book. After the free trial if you love it and want to keep using, I will recommend you buy the vitalsource drm removal full version. A: To get successfully logging into the account, firstly please make sure the Internect is connected well. And then ensure that the account info is correct. Please remember that if you had 2 accounts (student or learner, instructor or educator), each time you can only remove drm from vitalsource books under the dedicated account. For example, if the book is bought by the learner account, please log in with your learner account to download your books. If purchased under educator account, you must log in with your educator account to begin the drm removing. Q: Could I edit the converted PDF books after the .vbk drm removing? A: I've explained in detail at the first part that, the regular .vbk files contain 2 formats: ePub or PDF. If your original text book is ePub, you can edit the converted PDF file, such as copy, highlight, bookmark, etc..More info you can also read this guide convert vitalsource VBK to PDF. Q: Is there any way to convert the vitalsource book and still keep the text characters? A: Some customers complained that they can't edit (search, copy, etc.) the texts after converting vbk files to PDF. I should stress this point again here: If the original vital book is an ePub (reflowable), the downloaded file you will get will still be ePub; If it was a PDF, the output file will be the PDF! A: As far as I know, there doesn't exist any any ebook converter capable of directly converting .vbk files to PDF buy keep the text characters. Wish epubor team (or others) could find out the solution soon. These 3 tools I all tried, but here I won't recommend you to try one by one because it's a waste of time and in fact there is no need to do like so. Of course if you have much interest in them, do as what you want, that's also great. Have a good look at this form that the comparison of these 3 tools supporting input format and output format. 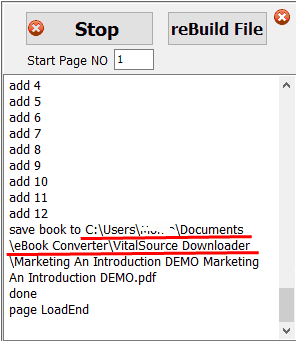 So if you would like to extract your vitalsource vbk files to regular ePub (the premise is that the original file is reflowable), you should choose eBook-converter's tool. 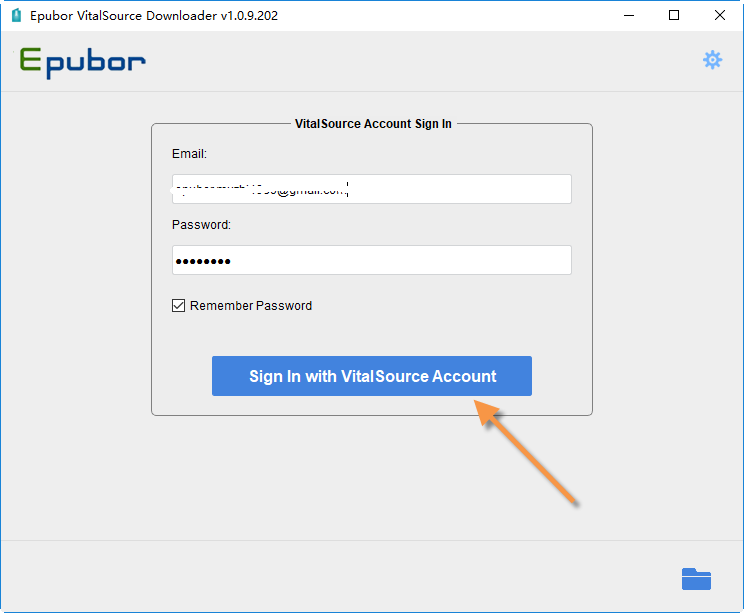 But if you want to print your vitalsource text books or convert them to common PDF for better reading, highly recommend you have a free trial of Epubor Vitalsource Downloader tool. Of course if you are a developer who is good at computer and code, use the python scripts is the easiest one. Following is a simple comparison of the file conversion speed when dealing with vitalsource ePub format and PDF text books. I should stress this point again here that the statistics are just based on my own testing because I just converted 2 books, one book has 46 pages and the other one has 131 pages. When using the recommended tool to remove the drm from your own text books, you may found that your conversion speed is much faster than mine or more slowly. This is not strange at all because they are based on the internet speed, book size and book typesetting. Wish this article could help you. If you had other suggestions or solutions to this, please leave your comments here. And if you think this deserves a trial and finally found it's really helpful and saves much of your time, don't forget to forward to a friend or share on the social network. maybe that Vitalsource has updated the reader, so e need an upgrade of epubor apps? Thanks for your kind comment and suggestion. Based on our own tests, the .vbk file location provided in this article is correct. Documents\My Books\VitalSource Bookshelf\VitalBook Library, this location also exists but you will find that there is no .vbk file. Vital source books are not put into a zip file which I cannot open to get to the vbk files. Any suggestions? And if you don't find the .vbk file in the "VitalBook Library folder", make sure the downloading from vitalsource is completed well. i rent a book from crc press and opened it via vitalsorce bookshelf but i want to download it so, i purchased epubor vitalsource downloader but, when i downloaded it, all paper in the book is blank and consequently when i tried to convert it to pdf , the pdf is also blank pages. please, i need urgently answer. I'm so sorry for that, epubor technical team now is fixing this problem as Vitalsource official site changed their technology on preventing downloading. Dowload the latest version of this tool from our site please. It fixed the problem that failed to open the downloaded ePub/PDF. Yes, we've released a newer version which fixed this bug. Please uninstall the current one first. Then download the latest version to your computer to get a trial. Right now Epubor VitalSource Downloader has encountered a bug which make it impossible to read the downloaded books. Once this bug has been fixed, we will let you guys know. I purchased a multi-license version 1.0.10.252 and the downloads are not working. The pages print the same message "please refresh your bowser". If you cannot provide a fix, please provide refund. Don't worry. This issue will be resolved within the next 2 weeks. If not, we will proceed with the refund. Thank you so much I was able to convert my vbk files to PDF & jPEG for every page with this lovely python script!! We are glad to know that it works for you. If i convert VBK files to PDF using epubor vital source downloader, will there be watermark also?Is there any way to remove the watermark as i would like to print the PDF out to study.